Buying a used Akai MPC 2000XL! Went to Guitar Center to pick my Elektron Machinedrum order and lo and behold what do I see behind the counter on their used shelf? 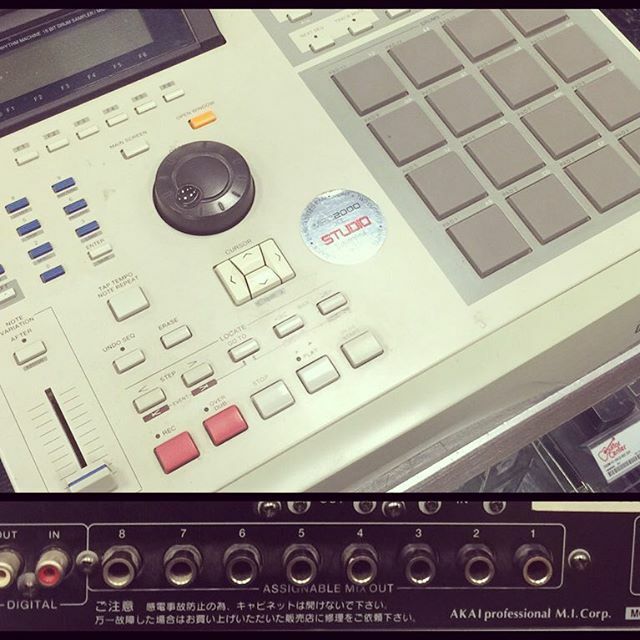 I see what appears to be an Akai MPC 2000. 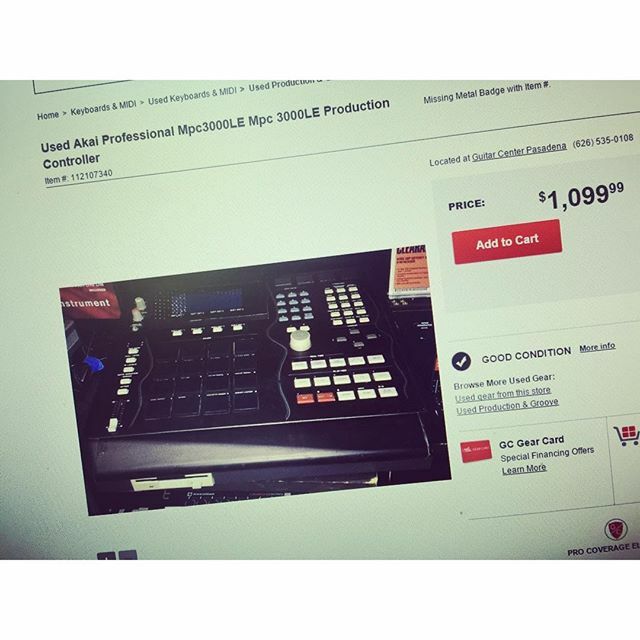 I go past the counter without permission and discover it is a MPC 2000XL proced at a low $199!!! It gets even better when I turn it around and find the 8 assignable output have been installed. I bought it on the spot without even testing it. I’ll have to pick it up later in the month though because of some local pawnshop law. The Akai MPC 2000XL is in high demand. I’ve been on the hunt for a 2000XL for a while now. I’ve had several leads on Craigslist but usually they get bought up quickly. On Ebay, they appear to average between $500 and $600+ depending on the upgrades and how clean the unit looks. Even broken units go for $300 alone. I can’t wait to trick this unit out. I’ll make sure the pad, buttons, and knobs all work. I’m crossing my fingers that the screens has no lines. I’ve already ordered parts to replace the floppy disk drive with an SD card reader. After a good clean up, I’m considering a paint job with a custom wrap. I can’t really justify having so many samplers so I don’t mind throwing this back on the market for a profit. Stay tuned! This entry was posted in Akai Pro, Music Gear Talk and tagged Akai Pro, MPC, MPC 2000XL, Samplers on March 11, 2016 by Eric PM. 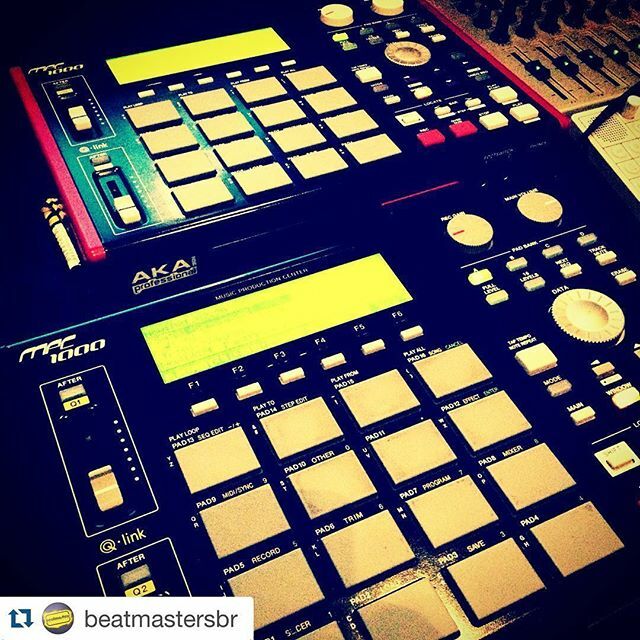 The Akai MPC 1000 was released with two types of pads. The original pads were individually mounted and can be replaced independently from each other. Those pads were extremely unpopular. They had a lousy feeling and were prone to failure. Akai eventually released MPC 1000 pads that are one piece with better feel and reliability. Some MPC 1000 shoppers are under the impression that a black MPC 1000 has the newer pad. This is not the case. Both of the used black MPC 1000s that I purchased had the version 1 pads. After discovering MPCStuff.com, I purchased the pad upgrade and did so again 5 years later for my second MPC 1000. I bought the yellow pads over 5 years ago. Although the upgrade was a true improvement over the version 1 pads from Akai, it did not really impress me. I would get the occasional double hits and adjusting the sensitivity didn’t always fix the problem. I read about a cork insert fix which only frustrated me. Why do I need to spend more money to make a product work better? I eventually moved away from the MPC 1000 and both units started to collect dust. 5 years later, I finally finished installing my 2nd pad upgrade from MPCStuff.com with the intent to sell it on Ebay. To my surprise this new set has a very nice feel to them. The response is really good as long as you keep your hits as centered as possible. You will achieve this with practice. I do not know if MPCStuff.com has changed the material the pad upgrade kit is made wit. These pads work so well, I almost want to but another kit to replace the yellow pads. 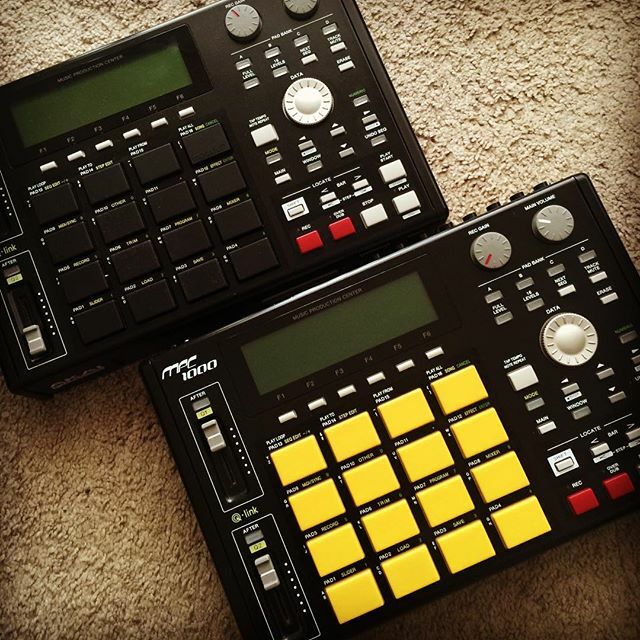 I have no intention to sell the MPC 1000 with the black pads. I’ll probably have to put the MPC 1000 with yellow pads up on Ebay. In closing, make sure you get a used MPC 1000 with the version 2 pads. 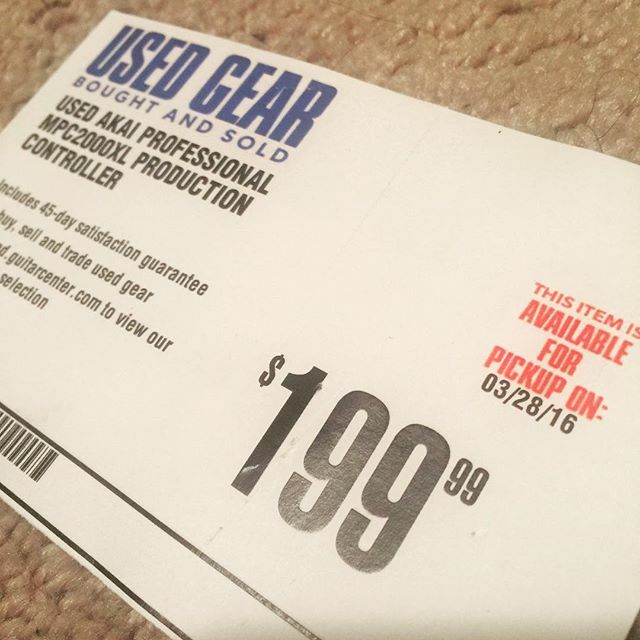 If you run into an MPC with the version 1 pads, don’t pay too much for it since you will probably need to get the pad upgrade kit from MPCStuff.com. This entry was posted in Akai Pro, Music Gear Talk, Samplers and tagged Akai Pro, MPC 1000, Sampler on January 30, 2016 by Eric PM. The Akai MPC 1000 is a good foundation for a computerless setup. This entry was posted in Akai Pro, NoisyBatt on Instagram, Samplers and tagged Akai Pro, MPC 1000, MPCStuff.com, Sampler on January 30, 2016 by Eric PM. Remember when Akai Pro used to make standalone MPCs? 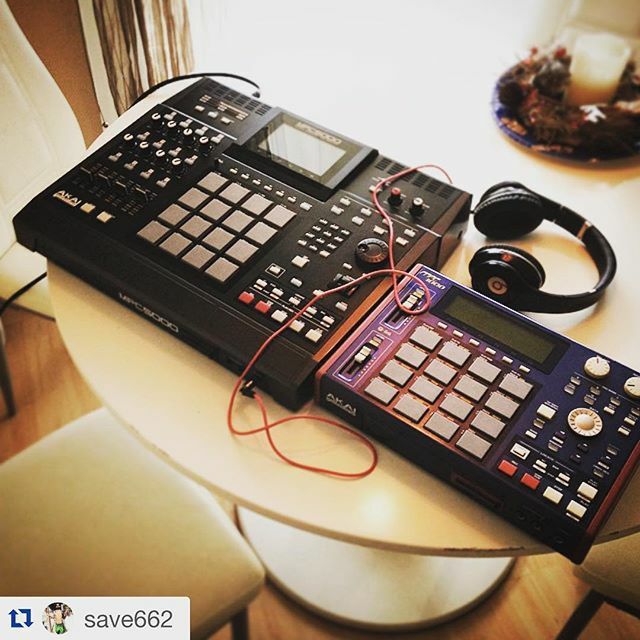 This entry was posted in Akai Pro, NoisyBatt on Instagram on January 16, 2016 by Eric PM.